A whole family of delicious eating apples on one tree. How it works. We have taken a Cox, Katy and James Grieve and then we then carefully graft branches from these individual varieties onto the original rootstock stem, the result being that different branches of the tree are the three different varieties. 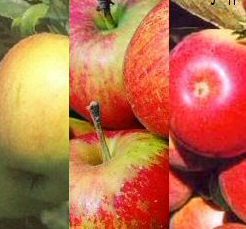 Another benefit is that the three varieties act as pollination partners to one another, so plenty of apples! Available on Rootstock MM106 (Semi-Vigorous) which means this tree will reach an approximate height of 3.6m (11ft) and the tree is supplied in a large 12 litre container for year round planting.